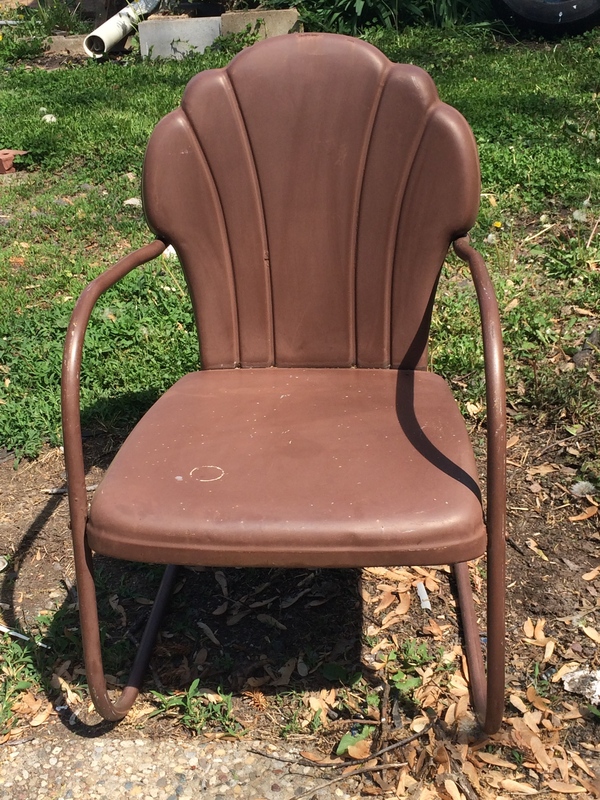 Over the past week or so, an hour here or an hour there, I’ve been spray painting my awesome metal patio chairs. I have 2 of these that I found at a store called – Quintessential Antiques. They are only open the first 7 days of each month. The rest of the time I believe they are hunting for neat treasures to carry in their store. 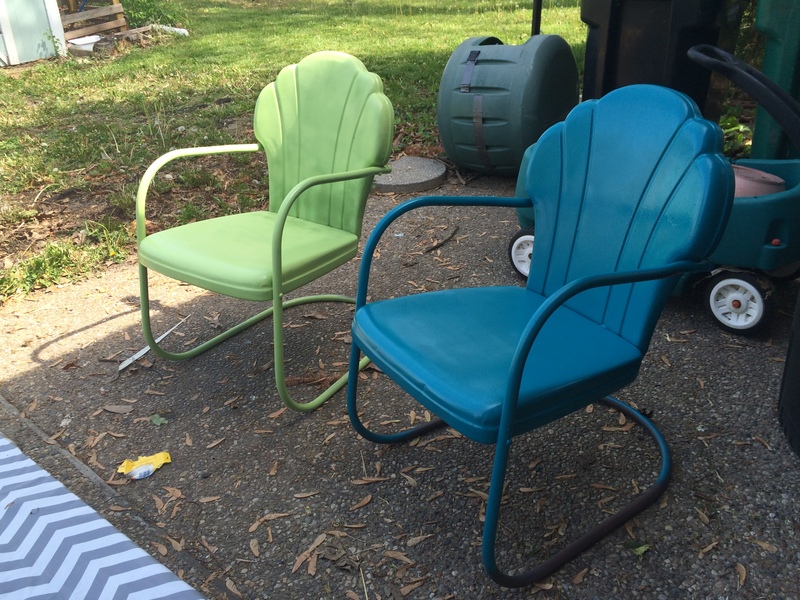 I went to our big box supply store and picked out two adorable colors for my chairs but spraying just that one chair made my wrist hurt – enough that I had to stop and take a break. From spray painting. (I probably have some undiagnosed carpal tunnel syndrome from high school ) . I think it’s probably the angle you need to hold your wrist when you use a spray paint can. I put spray painting on hold for a day or two. Running BACK to the store for more supplies over the weekend I discovered this: It’s a spray handle that you clip onto the spray paint can. 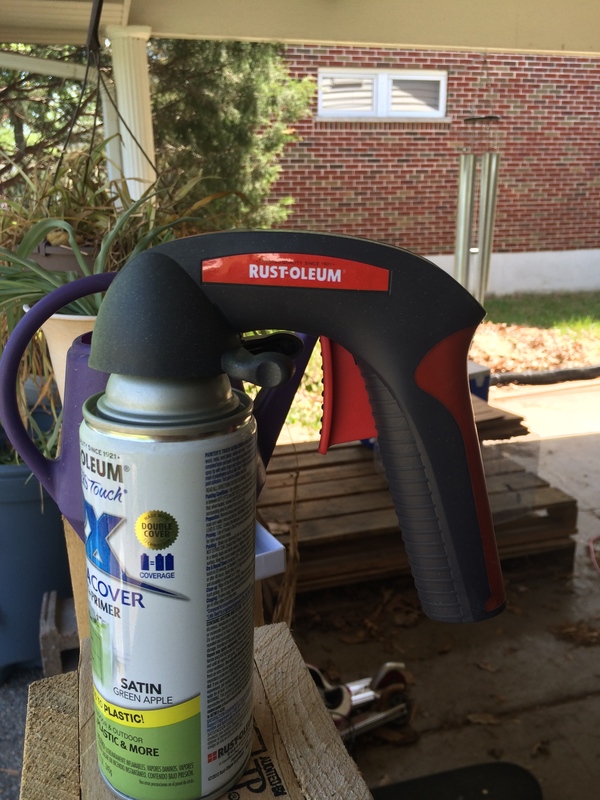 You can then squeeze it then like you would a spray bottle – Rustoleum brand – Sorry it’s not actually IN the box. Someone had that opened and on the can before I could say wait! let me get a picture! Oh well. There’s a gripper there that you squeeze open and it fits right on the top of the spray can, and a lever that pushes the spray nozzle down when you squeeze the handle. 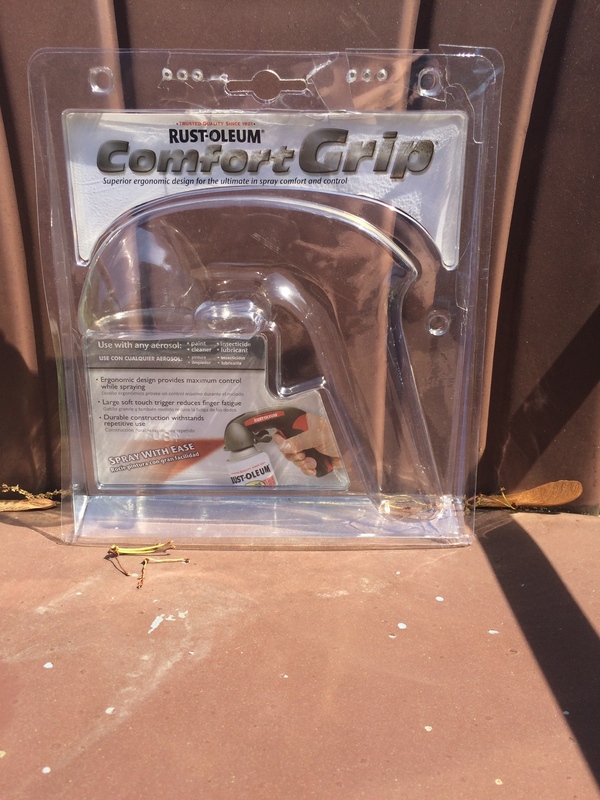 Your wrist seems to be at a more natural angle with this spray handle – not forced up and back. 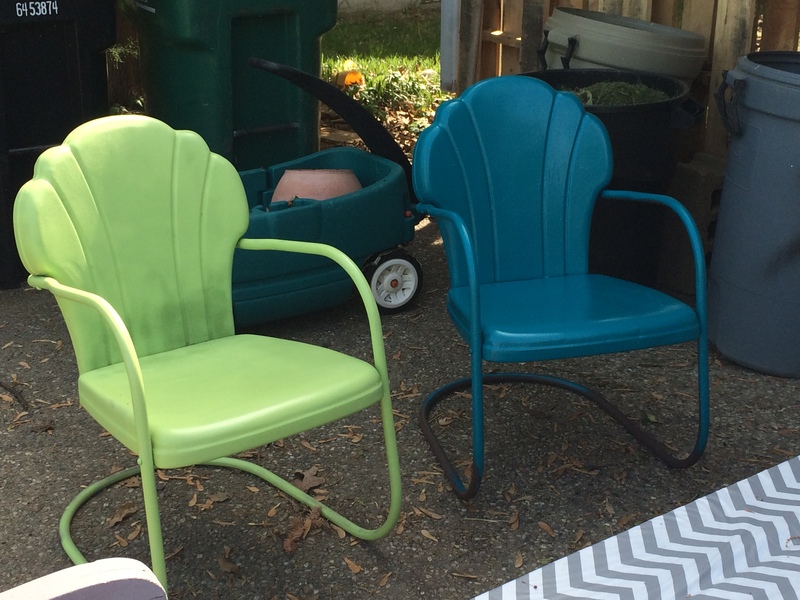 I am certainly not the best spray painter – my chairs have a lot of drips on them – but I love the colors that I choose! And practice makes perfect right? 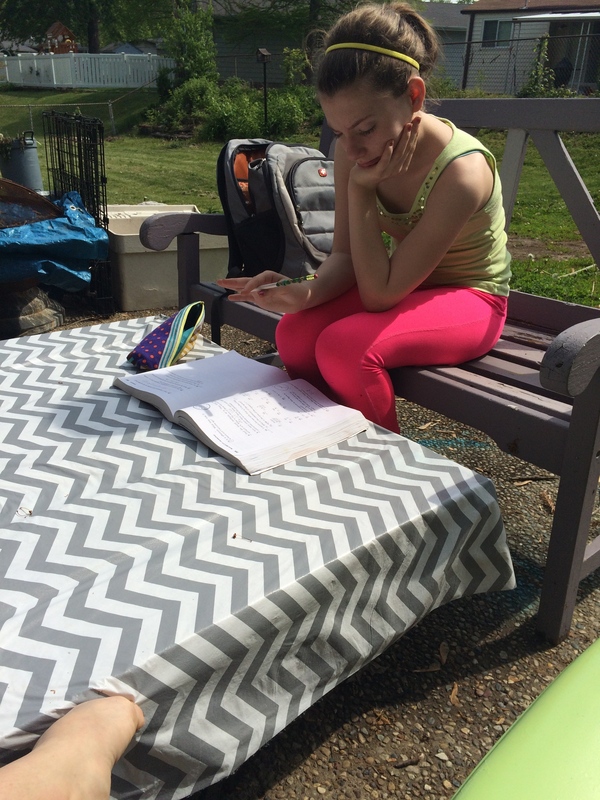 ….. Hmmm – what ELSE can I spray paint in this house……..
Jaia and I have been taking advantage of my awesome new chairs, the perfect weather and my makeshift outside coffee table ( a repurposed tire and pallet), to sit out side and have coffee, read and do school work…. 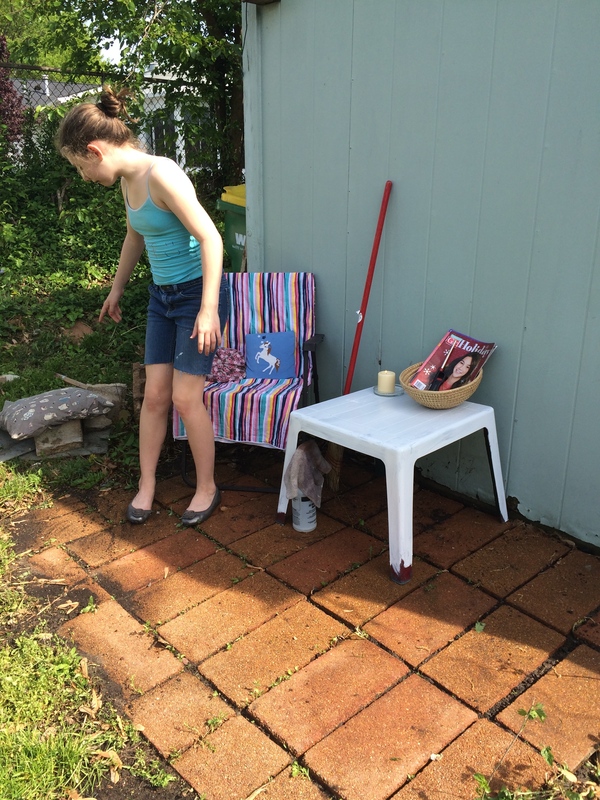 Jaia got into the act too and painted an old plastic table that’s been floating around the yard for years and made her own private sitting area. Well there you have it. My selling spiel. Fabulous right? LOL! Yeaahh for being minimally crafty!!! (that’s what I call it when I stumble upon something great like that!! !